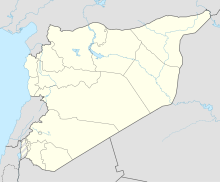 Menagh Military Air Base (or Minnigh airport, Minakh Air Base) (Arabic: قاعدة مطار منغ‎) is a Syrian Air Force installation located 6 kilometres (3.7 mi) south of Azaz, Aleppo Governorate, Syria near the village of Manaq. Menagh Air Base was home to the 4th Flying Training Squadron, equipped with MBB 223 Flamingo trainer aircraft and Mil Mi-8 helicopters. The air base became a major target of the armed opposition in the Syrian Civil War's Battle of Aleppo. The air base was under siege by opposition forces from August 2012 until it fell to the rebels and Islamists (including ISIL, the Northern Storm Brigade and Tawhid Brigades) on 6 August 2013. It subsequently fell under ISIL control. On 10 February 2016, the Syrian Democratic Forces from nearby Afrin captured the airbase, aided by Russian airstrikes. ^ "Minakh". Global Security.org. Retrieved 16 May 2014. ^ "If Syria's rebels can't take The Fortress, how can they take the capital?". The Independent. 24 January 2013. Retrieved 16 May 2014. ^ "Syrian rebels capture military airport near Turkey". Reuters. 5 August 2013. Retrieved 24 October 2017. ^ Joanna Paraszczuk. "Syria Analysis: Which Insurgents Captured Menagh Airbase — & Who Led Them?". EAWorldview.com. August 7, 2013. ^ "Syrian air base 'seized by Kurds and their allies'". The Telegraph. 11 February 2016. Retrieved 19 February 2016.